Many of us known that Aadhaar is one of the most important documents you will ever hold. Also, a vital proof of identity, it can come handy anywhere and anytime. 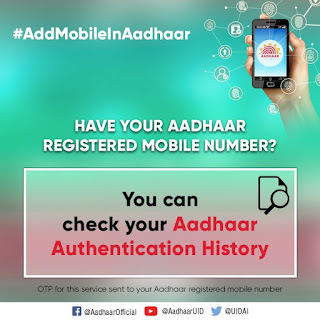 If you suspect that your Aadhaar data might have been compromised, or simply wish to check your Aadhaar card’s authentication history, you can easily do it online. To check your Aadhaar authentication history, first off, log on to the official UIDAI website. Next, under the ‘My Aadhaar’ drop-down menu, click on ‘Aadhaar authentication history’ link in the ‘Aadhaar services’ section. Following this, enter your UID/VID, and the screen-displayed security code. Click on ‘Send OTP’ button.